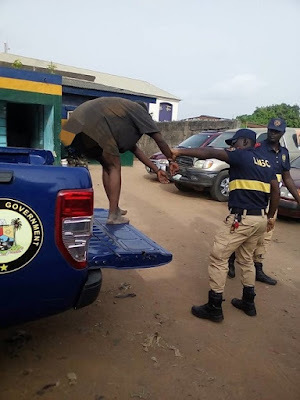 A woman named Nosimo, said to be 35 years old, barely escaped death yesterday, 27th of March 2018 after she was caught reportedly trying to kidnap a minor at Kolawole street, Papa Ashafa Orile Agege LCDA by Operation Officers of the LNSC Orile Agege command. She was beaten mercilessly and stripped by the irate mob. The woman from Ilisha in Osun state was however rescued by police officers for proper interrogation and investigation. The Divisional Police Officer (DPO) of Dopemu police division commended the efforts of LNSC officers for a job well done.